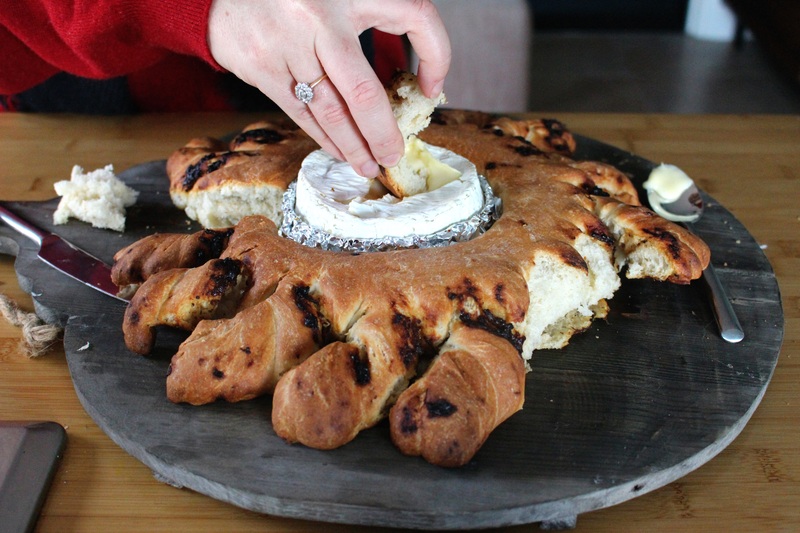 Bacon and camembert wreath | dash.drizzle.dollop.devour. This cheesy bacon bread makes a pretty centrepiece and provides a useful source of carbs to soak up all the alcohol! You need one of those camemberts that come in the little round wooden boxes for this. Weigh 500g strong bread flour into a bowl. Add 10g dried yeast, 10g salt, 30ml olive oil and 320 ml room temperature water. Mix together roughly and then turn out onto your work surface to knead. Try not to add any extra flour until you have kneaded for 5 minutes, as you might not need any. Just persevere with the sticky mess, stretching, folding and turning it for 10 minutes, until it comes together into a nice springy ball. Leave in a bowl covered in cling film for 1 hour, or until doubled in size. Remove the cheese from the box and cover half of the box with foil (to stop it burning in the oven). Then take your dough and gently form it into a log shape, then wrap it round the sides of the box. Using a sharp knife cut slices into the dough so that they form a radial shape around the bread. If you can get hold of bacon jam (I found mine in the supermarket) then use that, otherwise, I would use onion jam maybe with some cooked shards of crispy bacon added, although onion jam on its own would be equally lovely. Spread a layer over alternate bread strands and then twist each one around the plain strand next to it. I wish I’d added a little thyme at this point, I think it would be lovely on reflection. Repeat all the way around, then cover the bread in a clean tea towel and leave to rise again for another 30 minutes. Preheat the oven to 220C Fan and place the bread in the oven. Immediately turn the temperature down to 180C and bake for 20-25 minutes. Then tuck the cheese into the box in the middle and bake for another 10minutes until the bread is golden brown and the cheese is gooey and dippable. Depending on how cheese loving your guests are, you might want to have a second cheese on hand to bake separately and replace the first one as it gets eaten. A Christmas extravaganza! | dash.drizzle.dollop.devour.